Then and now: Wigtown in 1895, and 2003. Wigtownshire is a Scottish county, located in Galloway in the extreme South-West. Its history tells of a diverse ancestry. Gaels and Anglians, Norsemen and Northumbrians, Irish and Cumbrians, Scots and English all left a mark on this cornerstone of Scotland. Its history, deep and often hard to find, is etched into its villages, towns and farms and no less into its people and its hills and shores. Here we hope to offer you some small insight into this beautiful land of our forebears, with keys and links for your searches into history, geography and, especially genealogy. If there's a problem, please tell us so we can try to fix it. It's easy to forget how to make needed changes, so please don't hold back. We can use the practice, and can always be contacted through the "Contact Us" link at the foot of this column. Who are we? Wayne Hannay started "The Wigtownshire Pages" in association with the Rootsweb SCT-Wigtownshire list. 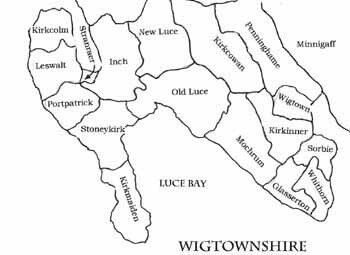 To read more about Rootsweb's mailing lists, and especially the very friendly and useful SCT-Wigtownshire list, [click here].